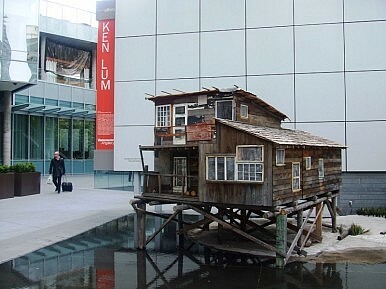 Artist Ken Lum’s latest gives us a peek into squatter communities of the past. Conceptual artist Ken Lum currently has an exhibit in Vancouver, presented at Offsite, the public art space of the Vancouver Art Gallery. 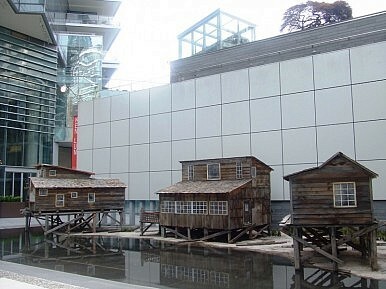 The site-specific installation, featuring three large wooden replicas, is based off of local squatters’ shacks that used to exist in the city. The mudflats then housed a unique community of people—before all were evicted and the homes were burnt down in 1971—including writers, artists and activists. I had a chance to see the exhibit, called ‘from shangri-la to shangri-la,’ when I was in Vancouver last week. And I was most impressed by how despite being so remarkably different from their sleek and modern surroundings, the brown, delicate houses were still able to evoke a sense of belonging while tucked into a very public space at the heart of the downtown core and adjacent to the main business district. It reminded me that, after all, they are rightfully a part of the city’s cultural and historical landscape, and although they’ve gone largely unnoticed by many in the past, they’re now garnering some attention (and even admiration) in their resurrected state, thanks to Lum. I was also surprised that the homes, at least as Lum chose to represent them, were not nearly as ramshackle as I’d imagined. Perhaps they may even work to subvert our preconceived notions of squatting and squatters. Although Lum’s family originally relocated from China to Canada over a century ago, the Vancouver-based artist seems still to maintain ties to his ethnic and cultural heritage. In 2005, he co-curated ‘Shanghai Modern 1919-1945,’ an exhibition about the Asian city’s art and culture during the republican era and in 2002 co-founded the Yishu Journal of Contemporary Chinese Art, which covers Chinese contemporary arts and culture. A report from London on the latest media influenced exhibit by this prominent artist.